Over the past few years, KCCG has seen a large increase in the number of people gardening in Wyandotte County. As the government, businesses and non-profit organizations take action to create a healthier county, we also see residents impacting health from the ground up by growing their own nutritious food. School gardens, backyard gardens and community gardens are popping up around the county and each one increases access to fresh fruits and vegetables for community members. To help facilitate this movement towards healthier lifestyles, KCCG has opened a large rental plot community garden in the heart of Kansas City, KS. 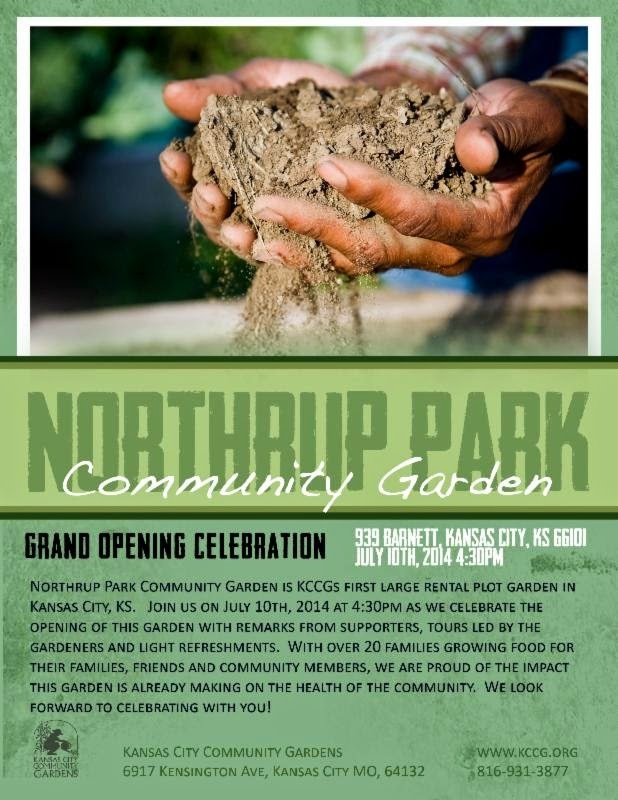 The idea for Northrup Park Community Garden sprouted years ago and has come to fruition with the help of partners like the Latino Health for All Coalition and the Unified Government of Wyandotte County Parks and Recreation Department. Thanks to the generous support of the Wyandotte Health Foundation, the Unified Government Hollywood Casino Grant Fund, BPU's H2O to Grow Grants Program and The Latino Health for All Coalition, KCCG was able to to turn an underused park into productive vegetable garden space. The garden is already home to over 20 families who are growing fruits and vegetables for themselves, their families, friends and community members. This garden celebrates the diversity of Wyandotte County with gardeners of various nationalities, races, ages, and socioeconomic backgrounds. We hope that you will join us on July 10th at 4:30 as we celebrate the accomplishments of the organizations involved in the creation of this garden. Stop by for a stroll through the garden with one of our gardeners, enjoy some refreshments and celebrate healthy living!